This time of year, we want a sweet, heartwarming story to put us in the Christmas spirit and The Christmas Note delivers. That’s hardly surprising, considering that New York Times bestselling author Donna VanLiere has made Christmas stories her specialty. This is her seventh seasonal offering; previous titles include perennial favorites The Christmas Shoes and The Christmas Hope. The story begins as Gretchen and her two children move into their new condo after her soldier husband was caught in an explosion. It’s not ideal, but at least it’s closer to her mother, Miriam. Maybe the neighbors will be nice . . . but no such luck. Melissa from next door is awkward and unfriendly. So when a strange man knocks on Gretchen’s door and asks her to give Melissa a message, Gretchen isn’t exactly thrilled. Especially since the message is that Melissa’s mother has died and she has only a few days to clean out her mom’s apartment before it all goes in the trash—not the sort of thing you want to tell anyone, especially a prickly stranger. Gretchen does deliver the message, though, and—somewhat to her surprise—even offers to help with the clean out. Melissa is too shocked to do anything but accept. They find a place that’s more trash heap than home, but buried in the mess is a treasure: a scribbled note telling Melissa she has a brother and sister she never knew about. And so, an unlikely friendship is born. As Melissa stumbles through grief and self-discovery, Gretchen has to deal with major issues of her own. Fortunately for both of them, Gretchen’s mom and her friend Gloria are on hand to help put the pieces together. These two are a delight; anytime they appear in the story it sparkles a little brighter. As well as memorable characters, VanLiere has a gift for making settings come to life. This novel is the next best thing to a movie and, like several of her previous Christmas novels, it may well become one. Even without benefit of video, readers will clearly “see” everything from Melissa’s barren living room to Gretchen’s kid-cluttered kitchen. As sweetly satisfying as the cakes in Gloria’s bake sale, The Christmas Note tugs on every heartstring. It’s likely even the most Scrooge-like reader will blink back tears on more than one occasion. 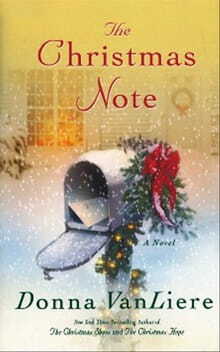 More than a Christmas fantasy, The Christmas Note tackles topics like forgiveness, redemption, attitude, and friendship. The story is so charming the reader may not realize how much they learned until it’s all over. The plot may strain the bounds of credulity a wee bit there at the end, but it’s Christmas, after all—the season of incredible events—so even a slightly farfetched “bow” that wraps up the final piece of the puzzle doesn’t seem that out of place. This review is of the audio version, which is perfect to pop in the car for a holiday road trip. It’s read by the author, an accomplished dramatist who pulls off a variety of voices and accents with ease. Visit Crosswalk.com’s Christmas Facebook page here.